PA State Rep. Tom Mehaffie - Who's Calling You? Who’s That Calling You?…To help consumers fight back against fraud, the House recently passed legislation to increase penalties for those found guilty of caller identification spoofing. Spoofing occurs when individuals use technology to make it appear that a call is coming from a number or business other than that of the actual caller. Spoofing can be used to defraud, harass or induce call recipients into divulging sensitive or confidential information, especially senior citizens. House Bill 979, which still has to be passed by the Senate, would make it a misdemeanor for any person to cause false caller identification information to be displayed on a recipient’s telephone, with the intent to harass or defraud the call recipient. ‘The Wall That Heals’ to Visit State Capitol… “The Wall That Heals” is a replica of the Vietnam Veterans Memorial, located in Washington, D.C. The replica wall, along with an accompanying mobile Education Center, will be displayed at the state Capitol in May. The opening ceremony will take place on Wednesday, May 9, at 7 p.m., and the closing ceremony will take place at 2 p.m. on Sunday, May 13. The display will be open 24 hours each day, and admission is free. Constructed of powder-coated aluminum, the exhibit features 24 individual panels bearing the names of more than 58,000 men and women who made the ultimate sacrifice in Vietnam. Since many Americans have not been able to visit the Vietnam Veterans Memorial in Washington, D.C., the Vietnam Veterans Memorial Fund (VVMF), along with creators of both the original wall and the replica, want to give all veterans and their family members an opportunity to see the memorial. Additional information about the mobile replica can be found at www.thewallthatheals.org. For more information about the Capitol event, or to volunteer to watch over the wall while it’s on the Capitol grounds, please visit www.legis.state.pa.us/TWTH. Budget Hearings to Focus on Accountability…During this year’s hearings about the 2018-19 state budget proposal, the House Appropriations Committee is focusing on better accountability of tax dollars, private sector jobs and the opioid epidemic. This past week’s slate of hearings included appearances by the Independent Fiscal Office, Pennsylvania State System of Higher Education and the departments of Revenue, Transportation and Conservation and Natural Resources. This week’s hearings will feature the departments of Environmental Protection, Agriculture, Corrections, General Services, Health, Drug and Alcohol Programs, and Military and Veterans Affairs along with the Liquor Control Board and the Office of Attorney General. The full schedule is available here, which will also include video of the archived hearings once available. Online Learners Now Eligible for State Grants…A new law will soon allow college students who take more than half of their classes online to have permanent access to financial aid. Act 5 of 2018, formerly House Bill 1653, expands a successful pilot program created in 2013 that permitted students who take more than 50 percent of their credits online from a college or university headquartered and located in the Commonwealth to receive state grants through the Pennsylvania Higher Education Assistance Agency (PHEAA). During the 2014-15 grant award year, more than 5,900 students received grant awards, totaling $8.52 million because of the pilot program. The new law will take effect with the 2018-19 academic year. More information about college financial aid is available at www.pheaa.org. 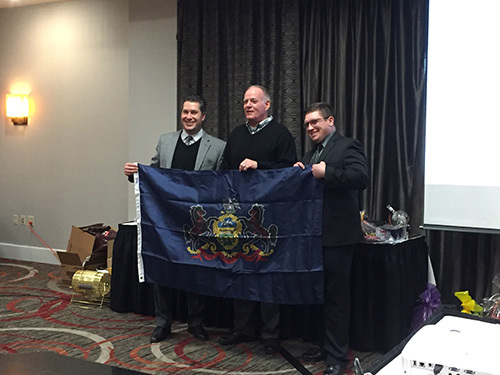 I recently presented a state flag to the Hershey Volunteer Fire Department at its annual banquet. Fire Chief Pat Leonard, President Patrick Rudisill and all of the volunteers do a wonderful job protecting Derry Township and beyond. We are all very fortunate to have such great men and women in the volunteer fire departments in our communities. My wife, Linda, and I joined Acting Secretary of State Robert Torres and Superintendent Dr. Lori Suski at a voter registration drive at Middletown Area High School. 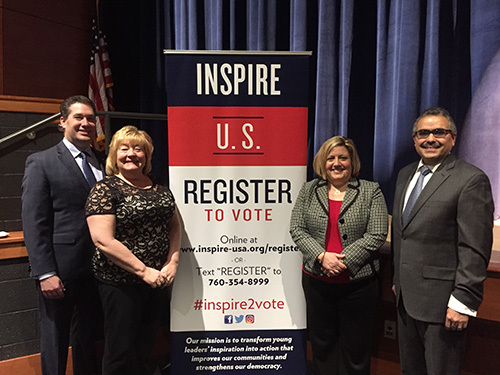 Secretary Torres talked to students about the importance of establishing a lifelong habit of voting. 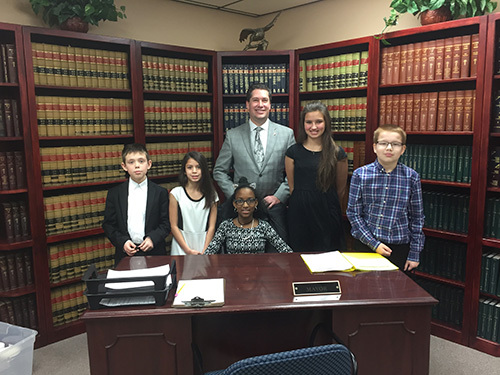 Recently, I watched the Hershey Intermediate School fifth-grade students take over “JA BizTown.” JA BizTown (Junior Achievement) is an 8,000 sq. ft. mini-city, which features 14 business storefronts. Students participating in the program learn how to run a business and manage their personal and business finances. They are then fully prepared to take on the task of running the town for the day. I had the distinct honor of administering the oath of office for JA Biztown Mayor Nyasia Weaver. 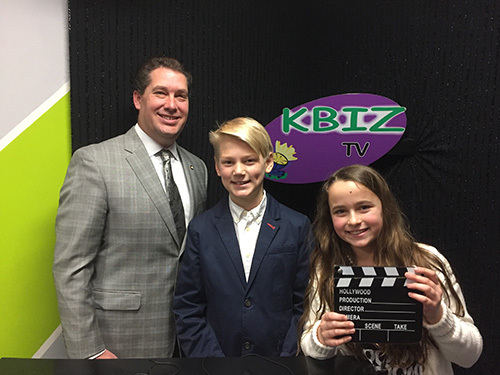 After her inauguration, I stopped by KBiz TV to do an interview, and then got around to the different businesses to see the kids in action. The kids had a great time and really got into their roles. Thank you to the students, the teachers and the JA Biztown staff for allowing me to participate in this real-world learning experience!